Posted Nov 28, 2017 by Eds. As this year marks the 150th anniversary of Das Kapital and 2018 marks the 200th birth anniversary of Marx, the great mentor of the proletariat seems to have “returned,” with more public attention and a more positive public image. Besides a Das Kapital exhibition at the Work Museum in Hamburg, other exhibitions about Marx have been unveiled. A large exhibition titled “Karl Marx 1818-1883: Life, works and times” is under preparation there, which will open next year. In Marx’s hometown Trier, a city spokesperson told Xinhua that the city is preparing for a series of big events to commemorate its most famous figure in history. A 5.5-m Marx statue will be erected at the end of this year and scheduled to be unveiled to the public in Trier on May 5, 2018, Marx’s 200th birthday. Among visitors of the exhibition were college girls Natasha and her classmates from Madrid. “Why do we come? Because we like him! Marx and his works have changed the world!” Natasha said, adding although the world is not like what it was 150 years ago, capitalism is still operating like what Marx had envisioned. “The exhibition is aim to raise a question for visitors: after 150 years of its publication, is Das Kapital still important or relevant? We can say that although the world has changed a lot, Das Kapital’s analyses are still up to date,” historian Joachim Baur, curator of the exhibition, told Xinhua. Herres told Xinhua that in the past few years, he found that readers of Marx’s original works are increasing. People discuss openly about Marx and his Das Kapital, and journalists write more about him in newspapers. Academic conferences about Marx and his theories have also increased. Three Marx’s biographies have been published this year, and he believed that more will come next year. Almost all German media reported the 150th anniversary of the publication of Das Kapital in early September and the exhibition in Hamburg. Deutsche Welle wrote in a story that the high-level monopoly of Germany‘s economy at present was precisely foretold by Karl Marx. Right now, the Rosa Luxemburg Foundation organizes Marx-reading groups “Das Kapital lesen” on a regular basis. It is also engaged in Marx Autumn School and has made the internet platform Marx200.org for his 200th birthday. Marx has also appeared more in Germany’s documentaries and films. Jointly made by Germany, France and Belgium, the “Young Karl Marx” made its debut In the Berlin Film Festival February this year and used to climb on top-10 box office list in Germany. 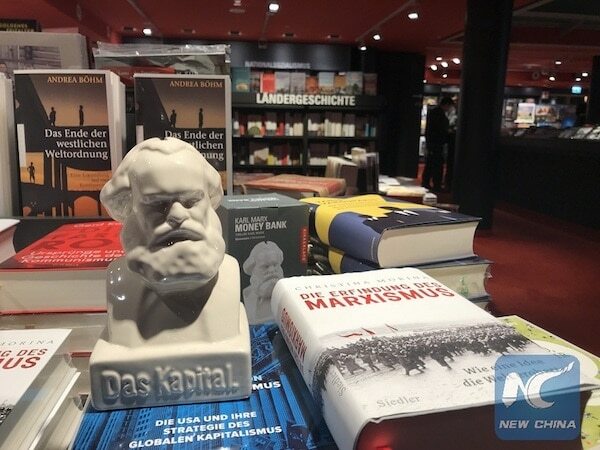 His image was printed on a credit card issued by a local bank of Chemnitz, and his bust-shaped money bank with a title “Das Kapital” is on sale in Berlin’s biggest bookshop Dussmann. “It’s like a renaissance,” said Baur, who believed that the multiple crises in the last few years, namely financial crisis, globalization, euro crisis and others have driven people in the search for ways of understanding of the current issues from Marx’s theories. Herres said Marx’s image among the German public is contradictory and split. However, after almost 30 years of reunification, Germans have begun to view Marx in a more objective attitude. “Many people have new interests in Karl Marx. What is with Marx? What can we learn from his theories? They are not interested in Marxism, but Marx as a philosopher, economist and a sociologist,” Herres said. It may be a “return” of Marx in his motherland, however, he may have never left in the first place. Compared to the United States and Britain, Germany focuses more on social equity and justice, a system jointly shaped by the class struggle and an array of German political thoughts since the 18th Century, including that of Marx’s. “Marx’s theories, especially Das Kapital, have also had an impact on economics and social sciences,” said Herres. Social reproduction theory: What’s the big idea?